Katherine Borland studies and teaches about the artfulness of ordinary life, and the ways in which traditional expressive arenas constitute contested terrain. Her current book projects include a collection of reflective essays on international volunteering in Central America, co-edited with Abigail E. Adams and entitled: Good Works in Central America? : Reflections from the Academy on the Practice of International Volunteering; and a text, tentatively entitled, Engendering Folkloristics and Folklorizing Feminism, co-written with Amy Shuman. She also plan to produce a film on the interactions of tourism and traditional performance in the Palo de Mayo Festival of Bluefields, Nicaragua. 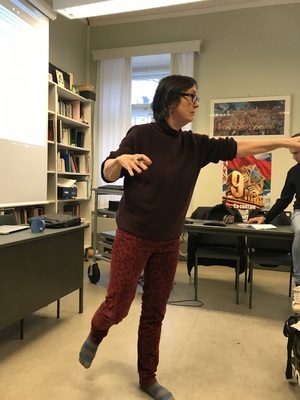 In her teaching she works particularly with undergraduate students to develop and hone interpretive, synthesizing and analytic skills through shared inquiry, team research and writing. "Exotic Identities: Dance, Difference and Self-Fashioning." Co-written with Sheila Bock. Journal of Folklore Research 48 (1) 2011:1-36. Explores the practices of embodying an other to explore/construct the self. Cosmopolitans in Ohio Face a Troubled World. Proceedings of the Congress of the Latin American Studies Association. 2010. Documents the emergence and increasing popularity of voluntourism and critiques its idealist intentions. Unmasking Class, Gender and Sexuality in Nicaraguan Festival. Univ. of Arizona Press. 2006. A study of the politics of culture in Masaya's Fiesta de San Jerónimo and related cultural performances during the Somoza, Sandinista and Neoliberal eras. "That's not What I Said: Interpretive Conflict in Oral Narrative Research" anthologized in Women's Words (1991), The Oral History Reader (1998), and Approaches to Qualitative Research: A Reader on Theory and Practice (2003). Examines ethical issues of representing and interpreting life stories.